This is a card I made for the new challenge at Crafting with Dragonflies. I created this card using pergamano (embossing and piercing parchment paper). I did not use any piercing on this particular piece. The vellum is a design from Pergamano and I layered it over Lovely Lilac card stock from Stampin' Up! I traced and embossed the thistle flowers on plain parchment and layered that on top of the Lovely Lilac card stock as well. I embossed and then cut out 6 of the flowers and laid them diagonally over the two different vellums to hide overlapping and added purple bling to the centers. I stamped the sentiment (Fiskars Birthday Sentiments set) with Memento Black Tuxedo right on top of the vellum. The dragonfly (Celtic Dragonfly from Stamp Oasis) was stamped on white card stock and colored with Copic markers (V20, V24, V28). I cut out the dragonfly and added clear crystals to the head, wings and body and colored them with the V28 Copic marker and used pop dots to adhere it to the card. Susan, this is just beautiful. I'm awed by your use of vellum and the embossing. Haven't tried that yet. Nor ever worked with Pergamano.Thanks for the how-to's. You did an outstanding job on this stunning & elegant card. TFS & have a lovely weekend. Gorgeous, Susan! I saw this at Outlawz and left you some love over there. Love the white row of flowers and all the vellum yu used. Absolutely stunning! This is beautiful!! What a gorgeous technique!! 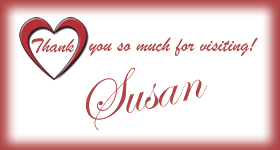 Susan - wow what an awesome design you have created here. I love the whole layout and beautiful colour. Love your dragonfly. So glad you have entered it in our first challenge at Dragonflies. Hugs birthday girl. Gorgeous card! Love that beautiful purple color and the flowers! Awesome. Your card is absolutely stunning. Love the purple colors too. Oh how gorgeous! Love the angled flowers! Susan, this is absolutley gorgeous!!! Your talent is amazing. Well you leave me flabbergasted each time!! Thank you for the explanation and for the incredible beauty!!! Absolutely stunning, Susan! Beautiful work. Unfortunately this was made before the start of the Simon Says Stamp challenge so is not eligible to be in the prize draw.